Every engine has motor mounts; in fact, most cars have multiple sets but what do they do and why are they important? 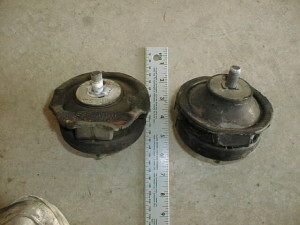 Motor mounts, also called engine mounts, are made of rubber and steel. The motor mount gets fastened to the frame of the vehicle and the engine gets bolted to the motor mount. The purpose of these engine parts are to (1) one secure the engine to the frame of the car and (2) two absorb road shock. Motor mounts are a straight forward concept so what is the big deal when they break? Excessive engine vibration: when the engine is under stress; for example, going up a hill, your vehicle will feel like a massage chair. You will be able to feel non-stop vibration through your steering wheel, and dash. Engine Rattling: NO those are not your teeth rattling that noise is the engine. When your motor mounts are worn your engine moves out of place hitting other mechanical components. This noise is most pronounced at idle. Loud noises: CLANG! That is the sound of the car forcing its gears into place. When motor mounts fail the gears in the engine and transmission do not line up properly causing friction and eventually breakage. Oil leaking: This only occurs in fluid filled mounts, like that of the Audi A6, but it is a tell tale sign that your motor mounts need fixing. Engine Position: The motor mounts keep the engine stable so all the moving parts align correctly and perform to specifications. 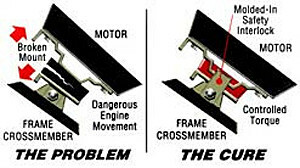 When motor mounts have failed the motor can shift causing internal damage. Belts/Hoses and surrounding mechanical parts: The movement of the engine will cause damage to the parts around it increasing the amount of money that will need to be spent on repairs. 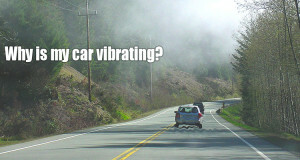 Transmission: Problems can radiate from the engine to the transmission. This could include internal damage to the transmission gears and axles leading to transmission failure. It can also wear transmission mounts faster as it compensates for the excessive movement of the engine.